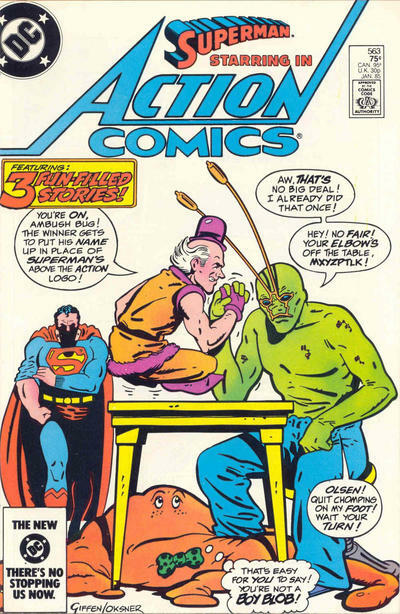 We come to the end of our Action Comics reading today with an amusing issue, the pro- and antagonists of which you can see on the cover here. It's really a showcase for the three in the foreground, with Superman popping in and riding herd on the chaos that ensues. There's mention in the letters pages of these issues of a switch in format which must have come slightly before this run of issues, and I think it's referring to the division of stories in the title, as well as the tone of those stories. Everything's a bit more light-hearted than contemporary Superman tales. And while there seem to have always, or almost always, been multiple stories in Action Comics, these stories all feature either Superman or members of his supporting cast, rather than B-listers like The Atom or the Human Target. I'm torn as to whether this is a good thing or a bad thing. I'm finding the Superman stories to be less-compelling than the ones that were being told in the more anthology-style issues from about 10 years earlier. This line of thought definitely looks ahead to the weekly anthology that starts in issue 601, which we'll get to eventually. It's been nice getting back into Superman, and I imagine I'll hit him up a bit more once July rolls around. I have a big project in mind for June, but until then we've got a few days of random bits and pieces from the collection to look at.